thank you for this!! the group scanlating this stopped at chapter one, been trying to find raws everywhere but no luck, until i find this site. Thank you guys!! hey do you know what software need to download in order to read this raw? I love this manhwa. I can not read Korean but I enjoy the pictures. Does anyone know, where I can read the spoilers? Once again, Thank you for your HARD work!!! Godspeed! 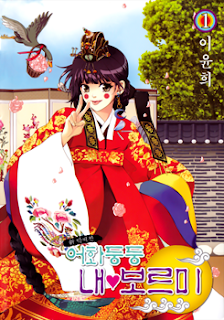 what software do i need to use to read this manhwa?? the title should be "my lovely boruemi". i understand that it's hard to translate, since "어화둥둥" is old Korean, but i have no idea where "don't cry" came from ._. Thank you so much!!!!! I love this manhwa!!!!!!! Can you please tell me when volume 6 will be scanned? When will you upload vol 6? I want to read it too.. I absolutely love this manhwa! Thank you so much for sharing this! Big cyber hug!!! when will the next volume come???? I am really expecting it!!!!!!!!!!!!! Thank you! I hope you will continue to give out raws for this manwhwa. It seems very interesting. ^_^ I feel so sad for the main girl because the main guy is a total jerk and to make matters worst, her dad is a jerk man ***t! thank you so much for sharing these real treasure!!! Hi, is there any way you can upload the vol 9 and 10 in mediafire or depositfile? I cant access uptobox in my country. Many thanks! ^ if it says its not accessible in your country, go to google chrome, and get one of the free extensions for vpn router that will change your address to a different country (switzerland works) i did that to download it and it worked fine! I think the 10th volume file has an error... it stops at page 103 and the rest of the pages are missing!! please fix it if you have time~ much thanks!! What's the password for uptobox?